As many people have access to D. J. K. O'Connell's green flashes, either in his book or his article in Scientific American, it may be helpful to interpret those photographs. For the most part, the photographs are not well explained in the captions or the text. Some of the descriptions are incorrect. Some artifacts in the pictures are identified, but others are accepted as real. The attempts to simulate the observed phenomena in the laboratory are only qualitative, and not very helpful; so I'll try to explain just the solar pictures. In reading the descriptions that accompany the photographs, one should be aware that the observer's estimates of color were usually strongly affected by adaptation (and, at sunset, by retinal bleaching) effects. The orange-red low Sun is usually described as “yellow” or even “white”, and the much redder colors shown on some photographs are mistakenly attributed to underexposure. There are so few pictures in the Scientific American article that I'll just note them in passing. If that's all you have access to, here are links to them: the cover, the series on p. 113, the series on p. 114, the red flash from p. 115, and the thin pair of flashes from p. 117. There's a slightly better-illustrated article in Endeavour, if you can find a library that has it for 1961. Links for it are: Figure 1; Figure 2; and Figure 4. The other pictures there are not in the book. I'll go page by page through the book, and describe what's in each of the pictures. This shows a succession of mock mirages, which produce the green ends in the top 3 panels, and the series of mock-mirage flashes in the fourth. The circumstances are described in some detail on p. 116. This series appears on p. 113 of the Scientific American article. The corresponding radiosonde data are on p. 177. The night-time soundings show a considerable thermal inversion, extending up to about the height of the observatory. The afternoon sounding, 3 hours before sunset, shows the normal daytime lapse rate, near adiabatic. The weather map on p. 116 agrees with the local reported wind direction, being driven by the surface pressure gradient from a small high-pressure system in northern Italy; the offshore wind carried the air heated in the afternoon over land out over the cold water. (Note that the date is one week into winter.) This caused the inversions that produced the mock mirages. The considerable asymmetry of the Sun is due to waves on these inversions; note the diagonal structures that modulate the flashes in the 3rd and 4th panels. The Sun was overexposed to show the green flashes properly. The overexposure saturated the red-sensitive layer of the film, making most of the Sun appear yellow. This is a common photographic artifact, which we see again and again in pictures of sunsets. Here, and in the next plate, we see the green rim. These pictures were mostly taken at sunrise, over the ridge to the east of the Vatican Observatory. That happened to place the apparent horizon a degree or two above the astronomical one — just the altitude where my simulations show the green rim most plainly. The conditions of no scintillation, and no wind, observed near sunrise, are typical for this time of day. The large literature on atmospheric turbulence is replete with examples of the calm periods for an hour or so around sunrise and sunset, when the ground and air temperatures are similar, and thermal turbulence is usually a minimum. “The sun's disc was observed visually in the guide telescope as white”, and the photographic colors are distorted by overexposure. Only the scattered light where the Sun spills over the roof of the building on the apparent horizon in Fig. 1 reveals its true orange color. The “long sharp green spikes” noted in Fig. 2 are due to mock mirages; the Sun is again overexposed, to make the dim green rim visible. Two pictures on p. 53 are supposed to have been taken 2 minutes earlier, but they're full of clouds. Something's wrong, possibly a date. The next several plates show green flashes at sunrise, over an elevated land horizon. … wherever the green shows, the sun's rim seems to be momentarily held back regard [sic] to the rising edge of the sun's disc (middle photograph); then it suddenly shoots upwards and at the same instant the green disappears (upper photograph). Clearly, what's observed here is local patches of looming or towering, which first stretch the green rim enough to be visible, and then cause the bright area inside the rim to have its rising motion magnified as well, when it reaches the zone of great vertical magnification. This isn't a mirage, but it's a related phenomenon. The image remains erect, but the vertical magnification varies rapidly with altitude (and, evidently, azimuth as well). The irregular spatial variations in vertical magnification in the boundary layer are hardly surprising. During the night, different objects on the ground cool by radiation to the cold sky at different rates, depending on their thermal inertias and infrared emissivities. The air in contact with these objects forms stronger local inversions over the colder patches of the surface. In addition, because the line of sight here is slightly inclined, variations in the slope of the surface produce variations in the path length through the surface inversion: where the slope of the ground is similar to the slope of the ray, the path length near the cold surface is longer; but where the ground falls away from the line of sight more steeply, it is less, and the towering is locally less. Similar effects are shown here. (Again, the discussion is on p. 45.) Once again, the local variations in vertical magnification widen or narrow the green rim, making it visible as “diffuse green vertical lines” where the stretching is large. Both these plates show the effects of strong overexposure. The actual red color of the low Sun is seen only in the diffuse scattered light at the edge of the apparent horizon. The overexposure is probably responsible for another effect: the correlation of the green parts in Fig. 2 with the higher features of the irregular horizon, and the apparent widening of the solar image (and consequent drowning out of the green rim by the locally overexposed disk) above the lower parts of the horizon. In the description on p. 45, O'Connell says the rim “seems pinched in” above the humps on the horizon; but it's really the other way around: the overexposed image spreads out more where the the horizon is lower, and overwhelms the green rim, “which was extremely faint on this occasion”. It's a sort of photographic “irradiation” effect. The caption on p. 50 explicitly puts this blue rim at 1°25′ above the astronomical horizon: right in the middle of the zone where the simulations show the colored upper limb best. Here, Fig. 2 shows a cloud-top flash. As this is stated to have been about 11 minutes before sunset, that places the flash about 2 degrees above the sea horizon, which normally has a depression of 36′ as seen from Castel Gandolfo (cf. the discussion on p. 100). This puts the cloud-top flash about 1°24′ above the astronomical horizon — once again, just where the green rim is most visible. The caption says these were taken Aug. 8, 1954 — the same date as Fig. 2 on p. 43 — but if this one was taken 11 minutes before sunset and that one was taken 9 minutes before sunset, the upper limb wouldn't have had enough time to get out of the could in those 2 minutes; yet the other picture shows a fine green rim and no trace of cloud. Maybe one of the dates is wrong? Fig. 1 is supposed to have been taken 1.5° above the horizon, which would make the red flash features due to waves on an inversion just above the observer. This black-and-white picture shows diffraction effects, as the caption states. However, the discussion of colors is misleading: it is the visual colors that are distorted by adaptation effects — the eye is dazzled by the first glimpse of the rising Sun, and sees it as “white” — while the film more correctly shows the low Sun to be yellow, where the over-exposure is not too great. The supposed “ray effects” here in Figs. 1 and 2 are almost certainly diffraction spikes due to some straight edge in the pupil plane. Again, the red-yellow color reported is correct, not due to “underexposure”. Fig. 3 here is Fig. 2 in the Endeavour article. The explanation of a ray appearance to the naked eye by a stack of mock-mirage flashes seems to be adapted from Mulder's book. Don't believe it. The “flames” here are probably due to modulation of the disappearing limb by waves on an inversion. The reported red color and lack of green suggest a fairly large aerosol reddening. The stratus clouds suggest the presence of a thermal inversion. The “spikes” are probably due to waves on it. However, the observation is puzzling because the time (15 minutes before sunset) places the Sun well above the astronomical horizon; it's unusual for such pronounced refraction features to appear at an appreciable altitude. The cause of the spikes must be much further off and at a great altitude, as Wegener also supposes. is complete nonsense: the cause has to be close to the observer, where the line of sight is most nearly horizontal; and, in addition, Wegener never supposed anything of the kind — see my discussion of his principle. Additional pictures from this sunset are on p. 158, Figs. 1 and 3. The cross-references to other pictures from the second sunset are also very useful: pp. 95, 162, and 163. These confirm the presence of an inversion with waves on it. A nice example of a sunset showing both inferior mirage and mock mirage: the mock mirage produced the piece that detaches at the top, while the inferior mirage is beautifully illustrated by the very compressed Omega-foot at the left side of the top panel, and the reflection at the horizon of the disk as a thin bright line below the left end of the island in the first two panels. The extreme compression of the inferior mirage is due to the great height (450 m) from which these pictures were taken. As O'Connell remarks several times, the sea horizon is about 80 km away. As the layer of air in which the inferior mirage is produced is usually only a few meters thick at most, we can roughly estimate the angular extent of the mirage as the angular subtense of a few meters at 80 km. If we adopt 8 m as an upper limit to the thickness, the angle is 10-4 radians or 20 seconds of arc as the expected thickness. The width of the inferior mirage (measured from the apparent horizon to the fold line, as indicated by the left-most extremity of the island image) is about 1 mm on the printed page. The Sun's horizontal diameter, which is unaffected by refraction, is 121 mm, which corresponds to about 32′ or 1920 seconds of arc; 1/121 of this is about 16 arc seconds — as good an agreement as one could ask for, considering the roughness of the thickness estimate. Of course the connection with the upper atmosphere that is suggested on p. 62 is complete nonsense, as I have pointed out elsewhere, both in these pages and in print. Here we have the colored rims again, this time on overexposed (yellow) trails of Venus. The time is given as 16 minutes before setting, which makes the altitude about 170′ above the apparent horizon, or roughly 130′ — about 2° — above the astronomical one. Once again, this agrees well with the rim simulations. Because of the considerable altitude above the astronomical horizon, the irregularities here must be attributed more to “seeing” (the effect of turbulence on image distortions) rather than layered structure in the atmosphere. O'Connell's use of the word “scintillation” to describe these effects is somewhat misleading. More red and green rims, this time on guided exposures of Venus, rather than trails. The value of these pictures is diminished by the lack of information on the altitude above the horizon. This section deals with “The Green Segment with Green Flash”. The term “green segment” was introduced by Nijland, though Winstanley had used the word “segment” earlier. This horizon is slightly below the astronomical one, so some miraging is possible. However, examination of the details shows only some vertical stretching, like that shown on Plate V; so only towering is at work here. But that is enough to exaggerate the green rim at the horizon line, providing the green cusps of the “segment”. This is an inferior-mirage flash (cf. the previous discussion of how narrow this mirage is as seen from 450 m height). This agrees with O'Connell's caption: “at the sea horizon”. The slightly up-turned tips of the disappearing orange Sun in Fig. 2 here are typical of the inferior mirage; O'Connell even draws attention to them. The gradation of color, from “yellow in the centre, to blue in the extremities” is also typical of inferior-mirage flashes. The only thing unusual in this one is the extreme vertical compression of the mirage, due to the great height of the observer. Another inferior-mirage flash. The only peculiarity here is the “strange inversion of the green rim to an intense red rim” — yet another example of an overexposure artifact. The red color is the correctly-exposed color of the Sun; the yellow in most of its disk is due to overexposure. The red rays are crepuscular rays, probably due to a patch of high cloud beyond the horizon; they are fainter than the Sun's disk, and were correctly exposed here, showing the actual color of the setting Sun. But, as they are broader and brighter than the green rim, they hide it when they appear. The tip-off is the phrase “rays … which seem to start radially from a point below the horizon” — typical for crepuscular rays, which always appear to radiate from the Sun (whose center is below the horizon here). Curiously, although O'Connell refers here to the demonstration of overexposure effects on p. 173, he fails to realize that this is the cause of the yellow color in the overexposed part of the Sun's image. The radiosonde data on p. 81 do not extend to sea level, but do show a boundary-layer lapse rate near the adiabatic value of 10°/km. However, at this time of year (September and November) the water is still warm from the summer's heat, and the generally northerly winds were probably bringing in air cooler than the water. The weather maps on pp. 82–83 show cold fronts to the north and west. The two pictures on this page are reversed; the lower one clearly precedes the upper. What O'Connell is calling “layers of discontinuity” here is just a series of mock mirages, due to a corresponding series of thermal inversions. These pictures were taken about 4 minutes before sunset (cf. p. 99 for the sunset times), so the upper limb here is probably close to the astronomical horizon, or even a few minutes of arc above it. This probably accounts for some of the “difference in the structure of the spikes.” The rest of the difference has to do with the spectral response of the film, and the dispersion curve for air, combined with the sharp cutoff at short wavelengths (and hence, the details in the upper limb) due to extinction. The asymmetries visible in this and the previous picture are due to waves on the inversions. These waves have produced the upper-left to lower-right tilt of many fine details, due to the oblique viewing of the wave fronts. This accounts for the “upturned corners” noted by O'Connell. The lack of wind, and the “distant layers of haze” also are symptoms of thermal inversions. This page shows the development of an inferior mirage just above the sea horizon. The last panel on this page shows the lower limb beginning to stretch toward the horizon as it enters the zone of large vertical magnification associated with the inferior mirage. This causes a sort of stalk to develop between the disk and the line at the horizon; when they join, the line becomes the feet of the Omega. That development is shown on the next page. The doubling of the inferior mirage shown in the top panel is puzzling. This page shows how the lower limb seems to reach out to the line at the horizon. They join at the fold line that separates the erect (above) and inverted (below) images. The reason for the great reduction in height of the reflected image is that the effective reflecting surface nearly follows the curve of the Earth. You can think of the inferior mirage as a minified reflection in a convex surface. Because of the height of the observer (450 m), an appreciable part of the curved Earth is seen, foreshortened, at the horizon. Notice how the line at the horizon (which is the inverted and compressed, miraged image of the zone of sky a few minutes of arc wide just above it) grows wider as more of the lower limb sinks into the miraged zone. This shows the development of the last mock-mirage flash (top two panels) and the inferior-mirage flash (bottom panel) as the upper limb reaches the horizon. In the last image, the miraged green rim is disappearing at the fold line, above the apparent sea horizon. A slightly earlier stage appears in Fig. 4 of p. 161. The fold line is also marked by the raised extremities of the miraged upper limb in the first two panels. These extremities are about 2 mm above the apparent horizon seen at the center of the image; but note that only 10 or 12 mm of the upper limb is still visible here. So the lowest point on the solar image is not really the apparent horizon, but is just the inverted (miraged) image of the upper limb. This series of 5 appears on p. 114 of the Scientific American article. The “green glow” on the left-hand column is a broad crepuscular ray illuminated by the vanishing green flash. No structure is visible here, probably because the sea was too calm to modulate the flash. The appearance of raised corners on the glow is a perspective effect. The highly structured inferior-mirage flash shown in the right column appears to be modulated by bad “seeing” (turbulence) between the observatory and the horizon. This sunset also appears at the bottom of p. 61 and on pages 162 and 163. This section mentions “Layers of Discontinuity” in its title and text. This is hardly a standard term in either astronomy or meteorology; one wonders exactly where O'Connell got it, and what he thought it meant. In some cases, it seems to refer to any thermal inversion; in others, only those strong enough to produce ducting. The online AMS Glossary contains the term “surface of discontinuity”, which it seems to equate to a front. But a front is hardly a discontinuity; and in fact the density and refractive index of air cannot change discontinuously. This sunset shows the typical features of mock mirages, produced by thermal inversions below eye level. As often happens, there are several inversion layers, one on top of another. Here, O'Connell's reference to a discontinuity layer clearly means just an inversion that produces the usual mock-mirage phenomena. Note that the sequence of images on this and the succeeding pages is down each column, rather than across the rows. Here, the inversion is stronger, so the refraction (and hence the extinction and reddening) is greater. This explains why the mock mirage in this case did not produce a green flash, while it did in the previous example. Now the “drop in temperature” has allowed an inferior mirage to appear at the sea horizon. It first appears as a line at the horizon in the upper-right picture. There does, however, appear to be a persistent discontinuity in extinction and refraction at the inversion, which might be a duct seen from above. However, the simulation of a mock-mirage sunset without a duct seems adequate to reproduce the main features (but without the inferior mirage at the horizon). O'Connell's “luminous sea horizon” is just the inferior mirage. These pictures form Figure 1 in the Endeavour article. Another sunset with both a nice mock mirage and an inferior mirage. The mock mirage here is milder than the previous one. 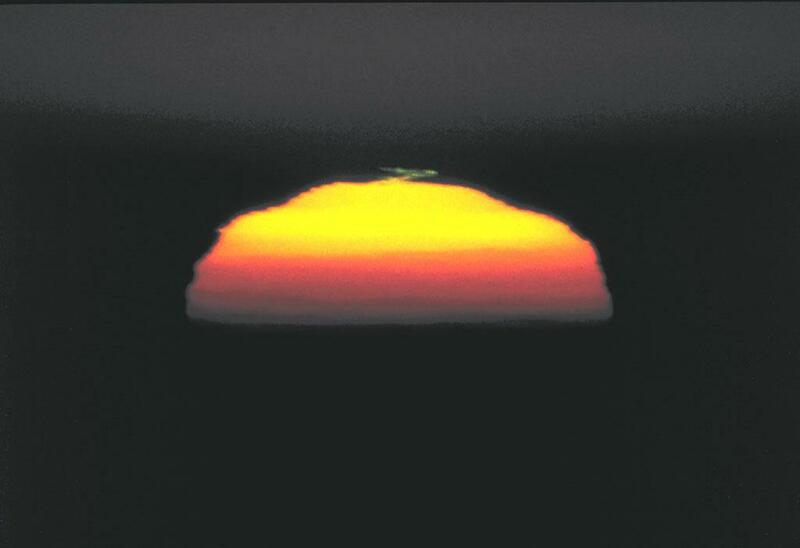 Compare with the simulation of a mild mock-mirage sunset. O'Connell notes the appearance of what we would call a mock-mirage flash. Once again, this is just a mock mirage, not Wegener's obscuring strip. Yet another day with both mock mirages and an inferior mirage! Instead of a single large inversion, which marked the previous two days' sunsets, there are now many small ones, producing finely detailed structure. The main feature of note is the zone of stretching that produced the vertical elongation noted by O'Connell. Such features often accompany ducts; and the sharp indentations in the sides of the image in the first half of this series suggest a duct below eye level. The images are too overexposed to be able to say anything definite about this, though. The high (cirrus) clouds shown in these pictures have, of course, nothing to do with the solar distortions. Now we're back to a nice mock mirage. Conveniently enough, O'Connell has marked this with a M in the second image. Once again, it's a mock mirage and not Wegener's blank strip. The Sun here is yellow because of overexposure; the true color is shown in the reddish edge and glow of scattered light around the edges. The bottom picture nicely shows a typical mock-mirage red flash. It appears to have been formed by a small duct below eye level; compare it with the simulation. The red flashes continue, and the inferior mirage appears at the horizon as well. The small red flash at the bottom of the upper image seems to be below a second small duct. The lower image appears as Figure 4 in the Endeavour article. Another low duct is visible here; note the discontinuity of both color (extinction) and the sharp indentation of the limb above the lowest red blob in the upper image. In the lower image, the inferior mirage has joined the main image, forming an Omega, as O'Connell notes. As the middle of the Sun reaches the zone of vertical magnification associated with these mock mirages, the limbs become vertical at the sides, and the notches disappear. Here is the famous series showing a ship at the horizon silhouetted against the distorted Sun. As the upper limb passes through the mock mirages, its multiple images make the re-entrant features reappear at the sides. A couple of small mock-mirage flashes are visible at the top of the disk. The two last mock-mirage flashes are caught in Figs. 2 and 3. Fig. 4 shows the inferior-mirage flash at the end of the sunset. As I have pointed out in my 2004 A. J. paper, the sharpness of the ship and the distortions of the Sun are explained by the ship's location between the principal planes of the atmospheric lens. It's also worth pointing out that the zone of sky against which the ship's superstructure appears is not very distorted in any case. A complex mock-mirage flash, apparently modulated by waves on the inversions above the surface layer and below the Observatory. The fine diagonal features, here inclined slightly from upper left to lower right, are typical of such waves. The picture is made more difficult to understand by the distant clouds, which are also miraged. These are the black features; the sky is gray, and the flash is white in these reproductions. The top picture shows the Sun's appearance when the lower limb reached the miraging zone. The inferior mirage at the horizon is strong, and the lower limb is drawn out by the series of mock mirages. This picture is really necessary to make sense of the ones on p. 133. The bottom composite shows the relations between the two: the indentations on the lower limb correspond to projections from the upper limb, and vice versa. Of course, these relations follow inevitably from the existence of a transfer curve. More examples of the complementarity of upper- and lower-limb features. These features are all due to mock mirages, which O'Connell attributes to his “layers of discontinuity”. As usual, his “blind strip” is not Wegener's obscuring strip at all, though it might be a shallow duct seen from above. The asymmetric and inclined features are probably due to waves on the inversions. Enlargement of some of the preceding pictures, showing the inferior mirage at the sea horizon, as the lower limb reaches it. More enlargements of the same sunset, showing the upper limb as it approaches the sea horizon. The lack of a green flash indicates that there was too much aerosol reddening to let green appear at the end. As usual, the “layers of discontinuity” are just mock mirages due to a stack of thermal inversions. This kind of complexly-layered inversion structure is quite typical after a few days of inversion conditions, when the sea-breeze circulation has had enough time to chop up the inversion structure thoroughly. The boundary layer becomes something like a piece of puff pastry, with many thin layers piled up in a stack. The red flash appears on p. 115 of the Scientific American article; the green flash is on the cover of the Jan., 1960, issue. The attempts to reproduce the observations in the lab are not very informative; they simply show that variations in atmospheric refraction can produce features similar to those observed, without revealing the significant features in terms of either optics or atmospheric structure. Here, Figs. 4 and 5 are actual sunset images. The former shows a red flash at the lower limb; the latter, the extreme flattening above a strong inversion. A good example of multiple mock mirages, due to multiple thermal inversions (which O'Connell calls “layers of discontinuity” as usual). The deep red color reported for the first 3 images is typically associated with sunsets having abnormally large refraction, and hence abnormally large reddening. The large extinction is quite plain at the bottom, where the Sun fades out. Fig. 4 shows features that are probably due to waves on the inversion responsible for this mock mirage. See p. 93 for later stages of this sunset with similar structure. Details of a mock-mirage flash. The fine oblique details sloping from upper left to lower right are probably due to waves on the inversion that produced the mock mirage. More examples of the same sort. Other pictures of this sunset are on pages 61 (bottom of page) and 95 (right-hand column). The top pair of pictures shows the development of a mock-mirage flash. However, the upturned corners of the bottom of the disk show that there was also an inferior mirage. (The later stages, including its green flash in color, were shown on p. 75). The second image is shown in color on Plate XXIII. O'Connell's comment that “individual waves can be distinguished in front of the sun's disc” calls for a rejoinder. The diameter of the Sun would be about 20 cm on the printed page, which corresponds to about 0.01 radian. The “waves” are several tenths of a millimeter high on the page; half a millimeter would correspond to 1/400 of a radian. At the horizon distance of 80 km, that would make the waves 2 meters high. This seems unreasonable for fair weather in a body of water as restricted as the Tyrrhenian Sea. Besides, the “waves” are just as big in the upturned corners of the image, which are merely the upper limb of the Sun reflected by the inferior mirage. Finally, the irregularities in the apparent horizon — which are probably due as much to thermal fluctuations as to height fluctuations of the sea surface — are also responsible for the broken-up structure of the inferior-mirage flash (cf. p. 75), which O'Connell calls “disturbed” on both pages. I have pointed out elsewhere in these pages the peculiar appearance of the sea horizon when there is an inferior mirage; this is yet another example. The picture at the bottom of the page shows the complex structure of a mock-mirage flash that seems to be perturbed by multiple sets of waves on inversions. Fig. 1 is a color version of the mock-mirage flash shown in Fig. 2 on page 167. Figs. 2 and 3 show in color the paired mock-mirage flashes that were shown in black and white on Fig. 5 of page 161. Fig. 4 is a color version of the inferior-mirage flash shown in Fig. 3 on page 175. Fig. 5 nicely shows the green tips on a thin mock mirage. However, O'Connell's comment about a “red lower border” is off the mark: the detached strip, as well as the main solar image, is yellow because of overexposure. The red border here is correctly exposed, and shows the true photographic color of the low Sun. Contrary to the caption, this does not show scintillation. It's the details of a mock-mirage flash, modulated by waves on the inversion(s) that produced it. The flash “was brighter than the portion of the sun's rim just below” because of the strong gradient in extinction near the horizon; see the simulations of this effect. (The bottom row of pictures shows it best.) The extinction gradient is more obvious in the upper of O'Connell's pictures. Mock-mirage red and green flashes. The “blue bridge” (shown in color on Fig. 4 of p. 169) is due to waves on the inversions; compare with my zigzag flash that was published in Zenit. Something has to be said about O'Connell's remark that “Perhaps the mixture of blue and yellow may have appeared as green …”. Adding blue light to yellow light makes white; this notion that blue + yellow = green is a common misunderstanding. See the introduction to color for examples and details. In any case, this little flash near the horizon is much smaller than the rays reported by green-ray observers. One problem is that different pictures of the same sunset (or sunrise) have been scattered about the book, so as to group similar phenomena together. Yet it's often impossible to understand a given image without the context provided by earlier or later views of the same event. Furthermore, the tables of radiosonde data and zenith distances are often well separated from the images of the sunsets that they refer to. Here's an attempt to match things up. I've decided to put the various dates together by season, regardless of year. That's because low-Sun phenomena are seasonal, so that what happens in September is likely to be similar from one year to the next. I've kept the series of days in Sept., 1956, together. This has slightly displaced nearby dates in other years.